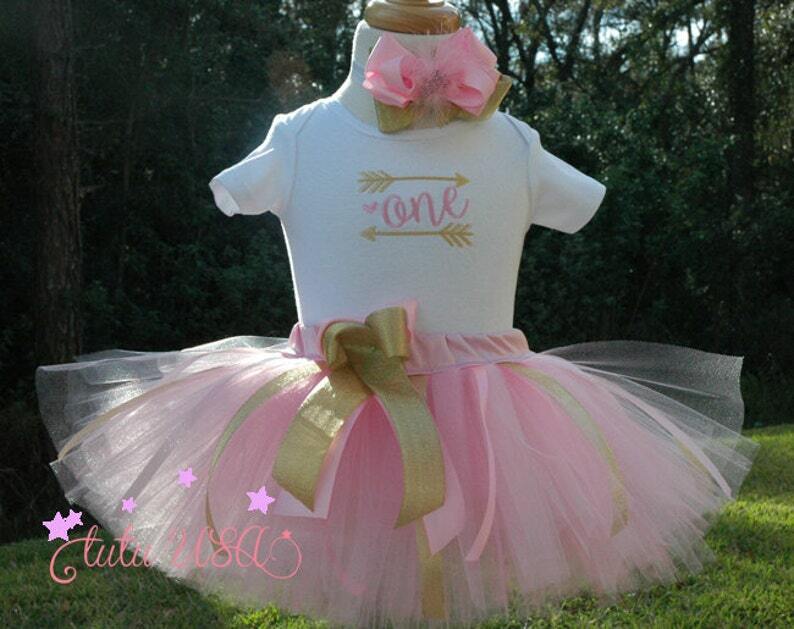 Beautiful Wild One Birthday Tutu Outfit. This 1st Birthday Outfit will be the hit of the party! Perfect for your baby girls 1st birthday photo shoot. Available for all ages. Custom made for each Princess. Long sleeve available. Shirt features the word ONE in gold in a gorgeous sparkly gold fabric embroidered by an embroidery machine. Tutu skirt has been created with soft high quality tulle. Hand cut tulle in many soft pink colors including sparkly pink tulle. Beautiful pink and gold strands of ribbon surround the tutu. Gorgeous long bow in front of the tutu..This beautiful tutu is very full and has been sewn not braided! The waist features a beautiful soft pink fabric. The beautiful boutique hair bow is made with light pink and gold ribbons and attached to an elastic white band. Bow features a super cute pink crown. Great communication and fast shipping. Outfit was packaged well and made our 1 year pictures and party extra-special!